For other uses, see Frisbee (disambiguation). Humans have been tossing disc-shaped objects since time immemorial. At first these were found objects such as rocks worn smooth in stream beds. Some were tossed for fun while others were used as weapons such as the discus. Throwing the discus became an event in the Olympic Games of Ancient Greece. Later, objects such as mats, hats, lids, pie tins, and cake pans were found to be perfect for tossing. Walter Frederick Morrison and his future wife Lucile had fun tossing a popcorn can lid after a Thanksgiving Day dinner in 1937. They soon discovered a market for a light duty flying disc when they were offered 25 cents for a cake pan that they were tossing back and forth on a beach near Los Angeles, California. "That got the wheels turning, because you could buy a cake pan for five cents, and if people on the beach were willing to pay a quarter for it, well—there was a business," Morrison told The Virginian-Pilot newspaper in 2007. The Morrisons continued their business until World War II, when he served in the Army Air Force flying P-47s, and then was a prisoner of war. After the war, Morrison sketched a design for an aerodynamically improved flying disc that he called the Whirlo-Way. after the famous racehorse. He and business partner Warren Franscioni began producing the first plastic discs by 1948, after design modifications and experimentation with several prototypes. They renamed them the Flyin-Saucer in the wake of reported unidentified flying object-sightings. "We worked fairs, demonstrating it," Morrison told the Virginian-Pilot. The two of them once overheard someone saying that the pair were using wires to make the discs hover, so they developed a sales pitch: "The Flyin-Saucer is free, but the invisible wire is $1." "That's where we learned we could sell these things," he said, because people were enthusiastic about them. Morrison and Franscioni ended their partnership in early 1950, and Morrison formed his own company in 1954 called American Trends to buy and sell Flyin Saucers, which were being made of a flexible polypropylene plastic by Southern California Plastics, the original molder. He discovered that he could produce his own disc more cheaply, and he designed a new model in 1955 called the Pluto Platter, the archetype of all modern flying discs. He sold the rights to Wham-O on January 23, 1957. [a] In 1958, Morrison was awarded U.S. Design Patent D183,626 for his product. In June 1957, Wham-O co-founders Richard Knerr and Arthur "Spud" Melin gave the disc the brand name "Frisbee" after learning that college students were calling the Pluto Platter by that term, which was derived from the Connecticut-based pie manufacturer Frisbie Pie Company, a supplier of pies to Yale University where students had started a campus craze tossing empty pie tins stamped with the company's logo—the way that Morrison and his wife had in 1937. The man behind the Frisbee's success, however, was Southern Californian Edward Headrick, hired in 1964 as Wham-O's general manager and vice president of marketing. Headrick redesigned the Pluto Platter by reworking the mold, mainly to remove the names of the planets, but fortuitously increasing the rim thickness and mass in the process, creating a more controllable disc that could be thrown more accurately. Wham-O changed their marketing strategy to promote Frisbee use as a new sport, and sales skyrocketed. In 1964, the first professional model went on sale. Headrick patented its design; it featured raised ridges (the "Rings of Headrick") that were claimed to stabilize flight. Headrick became known as the father of Frisbee sports; he founded the International Frisbee Association and appointed Dan Roddick as its head. Roddick began establishing North American Series (NAS) tournament standards for various Frisbee sports, such as Freestyle, Guts, Double Disc Court, and overall events. Headrick later helped to develop the sport of disc golf by inventing standardized targets called "pole holes", that was first played with Frisbees and later with more aerodynamic beveled rim discs. 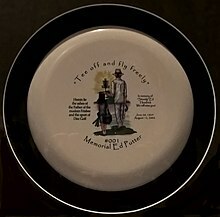 Headrick was cremated, and his ashes were molded into memorial discs and given to family and close friends and sold to benefit The Ed Headrick Memorial Museum. The IFT guts competitions in Northern Michigan, the Canadian Open Frisbee Championships (1972), Toronto, ON, the Vancouver Open Frisbee Championships (1974), Vancouver, BC, the Octad (1974), New Jersey, the American Flying Disc Open (1974), Rochester, NY and the World Frisbee Championships (1974), Pasadena, CA are the earliest Frisbee competitions that presented the Frisbee as a new disc sport. Before these tournaments, the Frisbee was considered a toy and used for recreation. Double disc court was invented and introduced in 1974 by Jim Palmeri, a sport played with two flying discs and two teams of two players. Each team defends its court and tries to land a flying disc in the opposing court. Dogs and their human flying disc throwers compete in events such as distance catching and somewhat choreographed freestyle catching. This is a precision and accuracy sport in which individual players throw a flying disc at a target pole hole. In 1926, In Bladworth, Saskatchewan, Canada, Ronald Gibson and a group of his Bladworth Elementary school chums played a game using metal lids, they called "Tin Lid Golf." In 1976, the game of disc golf was standardized with targets called "pole holes" invented and developed by Wham-O's Ed Headrick. In 1974, freestyle competition was created and introduced by Ken Westerfield and Discrafts Jim Kenner. Teams of two or three players are judged as they perform a routine that consists of a series of creative throwing and catching techniques set to music. A half-court disc game derived from Ultimate, similar to hot box. The object is to advance the disc on the field of play by passing, and score points by throwing the flying disc to a teammate in a small scoring area. The game of guts was invented by the Healy Brothers in the 1950s and developed at the International Frisbee Tournament (IFT) in Eagle Harbor, Michigan. Two teams of one to five team members stand in parallel lines facing each other across a court and throw flying discs at members of the opposing team. A patented game scoring points by throwing and deflecting the flying disc and hitting or entering the goal. The game ends when a team scores exactly 21 points or "chogs" the disc for an instant win. The most widely played disc game began in the late 1960s with Joel Silver and Jared Kass. In the 1970s it developed as an organized sport with Johnny Appleseeds and the creation of the Ultimate Players Association by Dan Roddick, Tom Kennedy and Irv Kalb. The object of the game is to advance the disc and score points by eventually passing the disc to a team member in the opposing team's end zone. Players may not run while holding the disc. Tron and Tron: Legacy, science-fiction films that make use of flying discs in their computerized combat. ^ It is often mistakenly reported that the company began producing Frisbees on this date, but production did not actually begin until a few months later. ^ "Flying Disc World Records". Retrieved November 13, 2014. ^ Overview of Trademark Law: Can trademark rights be lost? ^ a b c d Kennedy, Phil. "The History of the Frisbee®" (PDF). Wormhole Publishers. Retrieved January 19, 2019. ^ a b c d e f g Swift, Earl (May 27, 2007). "50 years later, Frisbee still flying high". The Virginian-Pilot. Retrieved July 28, 2013. ^ Walsh, Tim (October 2005). Timeless Toys: Classic Toys and the Playmakers Who Created Them. Andrews McMeel Publishing. p. 138. ISBN 9780740755712. ^ Latson, Jennifer (January 23, 2015). "How Frisbees Got Off the Ground". Time. Retrieved January 19, 2019. ^ Eisenhood, Charlie (January 23, 2017). "On This Day: Wham-O Acquires Rights to Frisbee in 1957 | Livewire". Ultiworld. Retrieved January 19, 2019. ^ "'Frisbee' Marks 50th Anniversary of Name Change". CTVglobemedia. June 16, 2007. Archived from the original on November 1, 2007. Retrieved June 19, 2007. ^ "Frisbee Inventor Dies at 90 - CNN.com". CNN. February 12, 2010. Retrieved May 2, 2010. ^ Morrison, Fred; Phil Kennedy (January 2006). Flat Flip Flies Straight! True Origins of the Frisbee. Wethersfield, CT: Wormhole Publishers. ISBN 978-0-9774517-4-6. OCLC 233974379. Fred Morrison: "Headrick had an eye for product design…. The "NEW LOOK" contributed mightily to its phenomenal success." ^ Malafronte, Victor A. (1998). F. Davis Johnson (ed.). The Complete Book of Frisbee: The History of the Sport & the First Official Price Guide. Rachel Forbes (illus.). Alameda, Cal. : American Trends Publishing Company. ISBN 0-9663855-2-7. OCLC 39487710. ^ "History of Frisbee sport and Flying Disc freestyle". Formative Years. Retrieved September 26, 2017. ^ "Ed Headrick, Designer of the Modern Frisbee, Dies at 78". New York Times. Retrieved June 14, 2002. ^ "The History of Disc Golf". Discgolf.com. Retrieved December 27, 2011. ^ "Edward 'Steady Ed' Headrick" Find A Grave. ^ ""Wham-O Frisbee Disc"". Archived from the original on May 30, 2015. Retrieved May 26, 2015. ^ "History of Frisbee and Flying Disc freestyle". Development of Frisbee and disc sports. Retrieved October 6, 2018. ^ "Jim Palmeri". Hall of Fame. Retrieved January 1, 2014. ^ Perry, Jeff (2011). Disc Dogs! A Beginner's Guide. Hyperflite. ISBN 9780981723747. ^ DDGA. "History of Disc Golf". Retrieved May 15, 2017. ^ FPA. "History of Frisbee and Flying Disc Freestyle". Retrieved May 15, 2017. ^ "Goaltimate Rules". World Goaltimate Association. Retrieved January 19, 2019. ^ Veale, Brandon (July 6, 2012). "Boggio boosted Guts frisbee in 1960s". The Daily Mining Gazette. Archived from the original on March 4, 2016. Retrieved August 1, 2012. ^ Robison, Daniel (November 2, 2012). 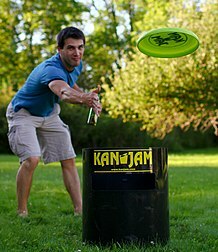 "'Trash Can Frisbee' – a local game – goes global as KanJam". WBFO 88.7. Retrieved April 20, 2013. ^ "Special Merit the Johnny Appleseeds" (PDF). USA Ultimate Hall of Fame. Retrieved August 26, 2018. Stancil E. D. Johnson (1975). Frisbee: A Practitioner's Manual and Definitive Treatise. ISBN 978-0-911104-53-0. Horowitz, Judy; Bloom, Billy (1984). Frisbee: More Than a Game of Catch. Macmillan Reference USA. ISBN 978-0-88011-105-8. Danna, Mark; Poynter, Dan (1980). Frisbee Players' Handbook. Para Pub. ISBN 978-0-915516-19-3. Tips, Charles; Roddick, Dan (1979). Frisbee, sports and games. Celestial Arts Publishing Company. ISBN 978-0-89087-233-8. Tips, Charles (1977). Frisbee by the Masters. Celestial Arts Publishing Company. ISBN 978-0-89087-142-3. Morrison, Fred; Kennedy, Phil (2006). Flat Flip Flies Straight: True Origins of the Frisbee. ISBN 978-0-9774517-4-6. Lorenz, Ralph (2006). Spinning flight: dynamics of frisbees, boomerangs, samaras, and skipping stones. Springer Verlag. ISBN 978-0-387-30779-4. Wikimedia Commons has media related to Frisbee. This page was last edited on 7 April 2019, at 17:29 (UTC).